Note: This is the original, uncut 132 minute version of the film. Being an Italian production, many voices, including Brando's, are dubbed in Italian. The film was released in the US as "Burn!" in an edited cut. Thank you for services. Highly recommended. A shamefully neglected picture on it's release. The short version, Burn, is already a great picture. I believe this movie is among the last ones in Marlon Brando's career and it's like a swan's song for him this masterpiece by Gillo Pontecorvo. Also the quality of the DVD is excellent. Years ago, I saw this movie dubbed in English, but is a delight to watch it in its original language thanks to Movie Detective. Moving, beautifully filmed, superbly directed, with a brilliant screenplay dissecting colonialism, civilization and capitalism. No one makes films like this anymore. 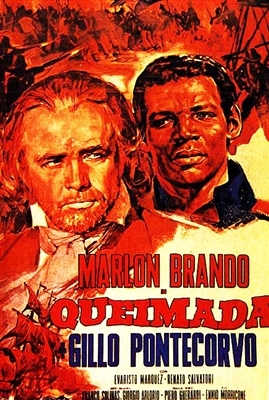 Brando - although dubbed in Italian - is splendid as the cynical but ambivalent English agent, and Marquez, though not a professional actor, is excellent. Subtitles could be better, but still a welcome opportunity to see this important film uncut. Utterly different, and dramatically better, than the usually seen English language version ("Burn!") which cuts maybe a half hour of the film. In some ways superior to the director's earlier "Battle of Algiers." Brando reputedly considered this performance one of his best. Only problem, you get to hear his lines -- and everyone else's-- in Italian.